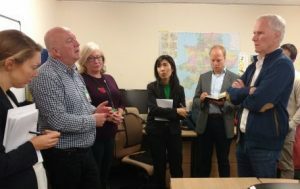 When the United Nations Special Rapporteur for Extreme Poverty visited the Newcastle West End Foodbank in Wednesday, the Oral History Collective was invited along to share some of the research findings from our six-month Foodbank Histories project, a partnership with Northern Cultural Projects. This work is also part of the Being Human festival, 15-24 Nov. So why is it important? The Newcastle West End Foodbank is best known to many people through the film I Daniel Blake, where one of the main characters, Katie, is so hungry she starts to eat cold beans from a can. In March this year, Northern Cultural Projects’ Silvie Fisch approached the Oral History Unit & Collective, and we began the Foodbank Histories project, listening to the real stories of food poverty that have made this the busiest foodbank in the UK. Initially, the project was divided into what seemed like three neat groups. Silvie interviewed foodbank clients, while research associate Alison Atkinson-Phillips interviewed volunteers. Jack, a PhD researcher who is also a member of the Oral History Collective, interviewed the Newcastle United Fans Foodbank group. What we realised over time is that the lines between these groups are fairly fluid. 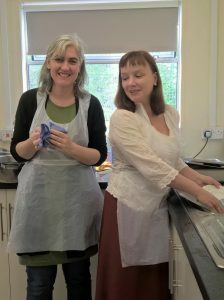 For Silvie and Alison, ‘Foodbank Histories’ involved a fair amount of hanging out, sometimes helping out with jobs like washing dishes, other times eating the delicious lunches at the Liliah centre or sitting having a coffee at the Venerable Bede church. We have made it clear that no-one is under any obligation to speak to us. Sometimes people are happy to be interviewed, other times they are happy to chat but don’t want to be recorded. Some interviews last for 10 minutes, others last 2 hours. To feed these histories and stories back to participants, to empower foodbank users and volunteers. To inform people about foodbank users’ circumstances and needs, with the aim of improving foodbank policies and service provision. To inspire future creative projects may be used to generate income for the Newcastle West End Foodbank. 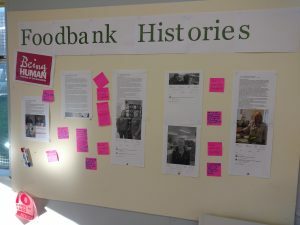 The Foodbank Histories exhibition at Grainger Market next week is part of the first and second of these aims, as have been the series of Facebook posts and a display at the Foodbank itself. The UN visit on Wednesday convinced us that we are on the right track. We were invited along by the Newcastle West End Foodbank management, because they see us as valued partners in the fight to raise awareness of food poverty. We didn’t speak directly to Special Rapporteur Philip Alston, wanting to ensure he had as much time listening directly to clients and to those who work with them every day. However, we were able to speak with some other members of the UN team. We were also able to provide some written material from our research and, as trusted intermediaries, make connections between clients and the UN visitors, and the media reporters who accompanied them. Perhaps more importantly, it seemed to us that, having had the experience of telling their stories as part of Foodbank Histories, some of the long-term clients had increased confidence to speak to the visitors. Most of us wish the Newcastle West End Foodbank did not need to exist. Nonetheless, the benefit it brings to clients and volunteers is, in the words of one of our interviewees, “more than food”. Many people – clients and volunteers alike – talk about finding friendship and community through the foodbank. Some claim it has saved their lives. It is not our job to address this contradiction, but to facilitate the telling of these stories. This is a project that isn’t funded by any external grant money: Silvie’s time is completely un-paid, and both Alison and Jack have needed to fit in their Foodbank Histories research alongside other major research work – in Jack’s case a PhD. For all of us, our commitment to this project is underscored by an understanding that our research practice should make a difference for the communities in which we work. Following on from the exhibition next week, we aim to spend some time in more detailed analysis of the research material, ultimately producing a formal report. Just like the work of this UN team, the report itself is not what will make a difference. What is important is that people read/listen and take notice of what the people with lived experience of food poverty have to say. Foodbank Histories: Journeys of Food Insecurity is part of the Being Human festival. 15-24 November, 11.00-2.00 Thursday- Saturday. This entry was posted in News, Oral History Collective, Oral History Exhibition, Partnerships, Public History, Research and tagged collaboration, foodbank, oral history, Oral History Exhibition, partnership working, policy, poverty, public history by Alison. Bookmark the permalink.